1. People claiming to have fellowship with Jesus but walking in darkness (1:6). Ephesians 5:6-16 explains the contrast between worldly darkness and Christian light. 2. People who claim they haven’t sinned (1:10) because they've redefined sin according to culture’s standards, calling God a liar. 4. People who claim to walk in light while hating their brothers (2:9; 4:20). If we can’t love Christians from different backgrounds, denominations, races, and cultures, we don't know Christ. 5. People who say they love God but really love the world (2:15). There’s only room for one master in our lives (Matthew 6:24). 1. 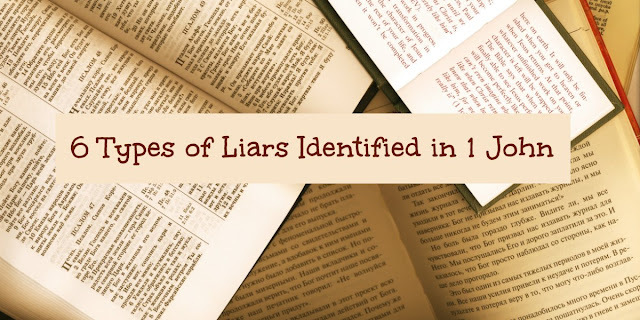 The first 5 liars John describes are "weeds" in the church: people claiming to have fellowship with Jesus, claiming to walk in the Light, claiming not to have sinned, claiming to love God. I find it interesting that Jesus says uprooting the weeds might uproot some of the wheat. Think of the ways that weeds damage a healthy garden. How might that apply to people in the church who are compromised, unrepentant, and self-serving? I too have many weeds that are starting to choke out my garden. I am surrounded by people who are so in love with the world and not of god that it spills over on me and I find myself acting like they do and I regret and hate myself everyday because of it. 24 This disciple is the one who testifies to these events and has recorded them here. And we know that his account of these things is accurate." So you see it's like scripture shares how we are to take the log out of our own eyes before the tooth pick/whatever it is out of another's. Christ never worried over another person doing wrong. Always be sin until He comes back & rids it. His mission was to bring good news, love, show the Father through Himself, walk One with Holy Spirit's leading, pray, teach, showed compassion + mercy, forgiveness, He healed, brought unity, showed faith, & desired such. He ask of us to do same. He was no doormat. He is a friend, family, & Lord to all believers. A nonbeliever He still loves, cares for, tells good news to, & patient with no matter what they decide in end. 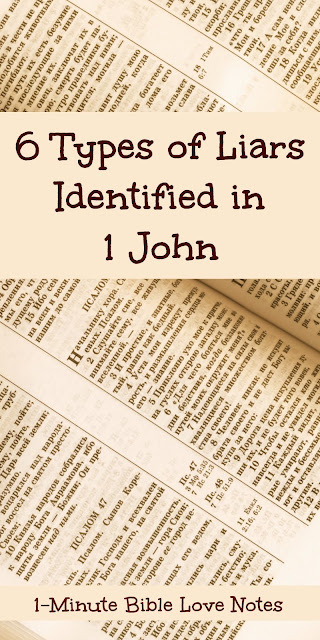 Why in John said we are follow Him. Don't worry of others live or die-spiritually or physical. Between them & God. You do all know do. Bring honor to His Name. Love as He loves. No one's perfect. Why each need Jesus. Pray others see lost or worldly. Give it to God. Love them where at where will be. All started somewhere. Sometimes ignorant. Pray discernment, & enlightenment. But don't hate sinner nor yourself. Just the sin. Go in peace. worst thing you can do is lie to me. God knew it! Lies come out, so do liars. This study is listing scriptures that talk about people claiming to be followers of Yahshua and not keeping the Commandments of Elohim! How many people refuse to observe the heavenly Father's Commands today and say they are followers ??? It's easy to lie, not lying takes practice we must hesitate a second or two and internalize what or why we want to lie, then make a concerted effort to TELL truth or just keep quiet. Some facts we know don't need to be shared this is not lying in most cases! TALK LESS LISTEN MORE it helps, thoughts that to more have more 'opportunity' to lie or state a false truth! Anyone who pays attention to human affairs and our common human nature, recognizes as I do that just as there us no one who does not wish to be joyful, so there is no one who does not wish to have peace. Indeed, even those who want war want nothing other than to achieve victory, by warring, therefore they desire to attain a glorious peace. What else is victory, unless triumphing over the opposition? When this has happened, there will be peace. Therefore, even those who are eager to exercise the military virtues by commanding or fighting wage war with the intention of peace, for everyone seeks peace, even by waging war, but no one seeks war by making peace. Even those who want the peace they no have to be disturbed do not hate peace, but they desire to change the peace according to their own wishes. Thus, they are not unwilling that there be peace, but they want it on their own terms. Furthermore, even if they have separated themselves from others through sedition, when they conspire or plot amongst themselves they do not achieve what they intend unless they have some sort of peace. Likewise, robbers themselves, want to have peace with their partners, so that they might more violently and safely attack to the peace of others. Perhaps one person is so strong and so wary of conspiring with others that he does not ally himself to any partners. Waiting in ambush and prevailing alone, he gains plunder by crushing and annihilating whom he can. Still, with those whom he cannot kill and from whom he wants to hide what he does, he certainly has some sort of a shadow of peace. In his home, with his wife and children and anyone else who might be there, he surely strives to be at peace. Their complying with his command is no doubt pleasing. If they do not do so, he is enraged; he rebukes and punishes them. He establishes peace in his own home, if it is necessary, even by brutality. He thinks that peace is not possible unless the rest of the household is subject to a ruler, and in his own home he himself is that ruler. That is why, if the service of a great multitude, or of cities, or peoples is offered to him, so that they would serve him in the same manner as he wanted to be served in his own household, then he would no longer conceal himself like a bandit I a hideout, but raise himself up like a visible king, although the same desire and malice would abide in him. Thus, all desire to have peace with their own associates, whom they want to live according to their own decree. Indeed they want, if they are able, to make even those against whom they wage war into their own associates, and to impose on them, when conquered, the laws of their own peace. Let us imagine someone of the sort sung about in poetry and myth, someone whom, perhaps because of his unsociability and savageness, they have preferred to call “semihuman” rather than “human”. His kingdom was the solitude of his horrible cave. So extraordinary was his malice that a name was invented for it, for in the Greek language evil is called ‘kakos’, which is what he was named. He had no wife with whom to carry on endearing conversation, no little children to play with, no older children to give orders to, no friends with whom to enjoy speaking. He did not even enjoy the society of his father Vulcan, compared to whom he was happier simply because he has not generated such a monster as himself. He gave nothing to anyone, but took from whomever he could whatever and whenever he wanted. I would think that almost everyone on the planet, Christians included, have deceived themselves, their families or friends, and even foolishly attempted to sheepishly deceive God at one time or another...if they say not, well then that speaks for itself. And after living in a Third World country, I even think as Americans, we kind of love the world by the often self centered, selfish or greedy choices we make, as we have so much. None of us are guilt free. We come humbly and repentant before a gracious, loving and forgiving (albeit infinitely HOLY) God each time and pray we learn from our foolishness and move forward in His light! Hopefully these scriptures help us to be humble, wise and discerning, and not finger pointing and judgemental as seems to be more prevalent these days in our social media society. When it does, time to retreat to seek God's wisdom which gives peace. And His Word is the "sword"/path by which we live...one we need not fear. We should take note that the weeds in this story are called tares. When young the tares looked similar to the wheat. This is Thayer's definition: a kind of darnel, resembling wheat except the grains are black. I really enjoyed this study of 1Johan. This claims 6 lies defined by John. Mathew props up one of them and Ephesians another. Could you please elaborate and define John. After each type of liar, you will see the chapter and verse where it is found in the book of 1 John. There are also some additional verses that confirm or expand what is given in 1 John and these come from other books in the Bible.